Aberdeen Foundries 'DEFENDER' brand Aluminium marine anodes come in the widest range of sizes and are for use in all types of applications for protection of harbours and jetties, platforms, ships hulls, tanks, drill rigs and pipelines. Aluminium is popular as base metal prices and specific properties of aluminium-zinc-indium based anodes make them the best value for money in terms of the protection offered per kg of anode weight. See our data sheets to select an anode of specific weight to suit your application or contact us to discuss your specific requirements. Medium to large flush fitting anodes. See medium to heavy rig anode data sheet A2. Drill rigs, frame anodes, harbour walls and jetties. All applications where flush fit is imperative. More sizes are available! Platform/standoff anodes. See medium size harbour/platform anodes data sheet A3. These anodes can be adapted to suit your attachment or standoff requirements. 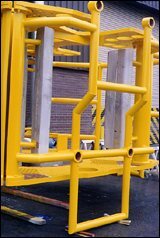 Large platform/standoff anodes. See large harbour/platform anodes data sheet A4. Click here for a drawing of most common anode used 60kg frame anode. 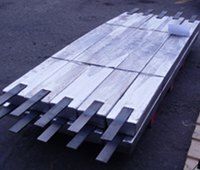 Aluminium anodes are AF Defender G3 specification which is an Aluminium-Zinc-Indium based alloy of the type commonly used around the world today. AF Defender G3 has a Type Approval Certificate from DNV for long term performance*. AF G3 Defender Aluminium Alloy Variants are attached here.